your support for protecting this valuable resource. The proposed area is outlined in red on the map below. You can also download this map. Some winter recreationists (snowmobilers, dog sledders, and skate skiers for example) require marked trail systems, informational kiosks, ready-made maps, warming huts, groomed trails, and lodges. Backcountry skiers, snowboarders, and snowshoers however, neither require, nor desire, such amenities. Instead, they seek the naturalness, solitude, challenge and inspiration that is an integral part of the unaltered and non-motorized landscape. pattern of motorized/non-motorized areas would be eliminated. The miles of signage (requiring an inordinate amount of maintenance) that currently weaves through the trees, ridges, and meadows would no longer be necessary. Instead, the obvious boundary of the snowmobile trails could be easily posted, maintained, and enforced. 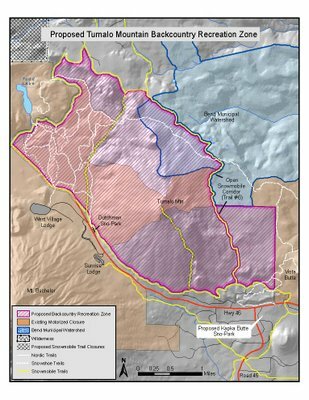 Forest Service manpower that is now applied towards posting the Dutchman corridor, the Bend Watershed, and Tumalo Mountain could then be redirected towards managing the influx of machines that the high- country will experience with the expansion of snowmobile parking capacity. Support for a new Snopark of equal or lesser size (measured in square footage) to the current Wanoga Snopark would be dependent upon full and effective mitigating action. manage an increase in snowmobile usage in the Century Drive corridor. 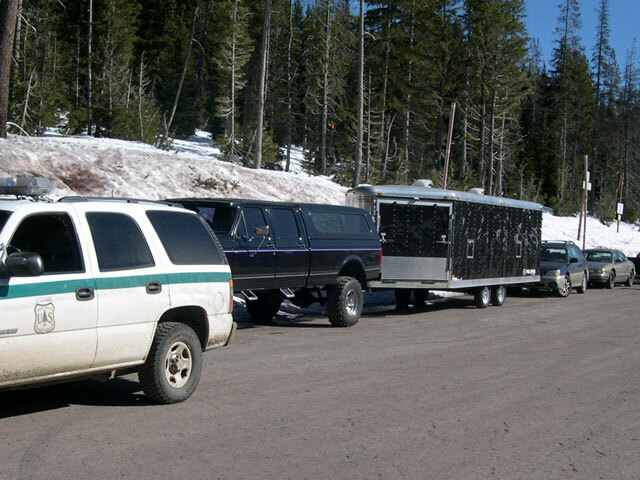 My photo from 2005 illustrates the unrestricted snow hauler parking problem in Dutchman snow park!